I am one of those people that hangs out for far to long in the grocery store, mostly in the bulk section, looking al all the types of rice, and grains, and beans, and seeds, admiring the variety and colors and also wishing I was one of those people that had an extra $25 to drop on a pound of pistachios. (Them were some pricey pistachios fo sho.) I take my time, peruse the bins, maybe take a little taste or two, and go for what I need. And maybe if something is on sale, get a little of that too. Things that usually make the list are spices, oats, beans, maybe rice or quinoa, flours, and seeds. Pumpkin seeds were on sale so those were the seeds of choice and I also got some barely because when I was starting at all the grains, it dawned on me that I don't know many people that eat barley, or even care about it, which is a shame because it is awesome. It might not be trendy like farro or freekeh, but it is just as good, and damn if it is not a hell of a lot cheaper. But I had all I needed for a barley salad situation so things went well. This is a fantastic salad. It's quick and easy and tasty and good. 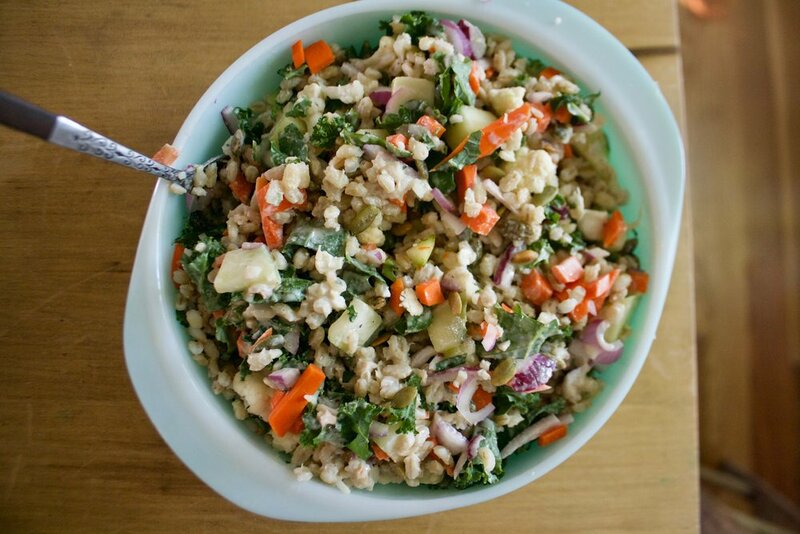 Barley, tahini, veggies and pumpkin seeds... It's all you need for a just right dinner, or a fantastic side to any meal. Or as a snack at anytime. Bring it to a BBQ, a graduation party, or a pot luck. it will get eaten, and if by chance you end up with a little left over, bring it on home and eat it for breakfast. It will still be just as good. While barley is cooking (or is cooked) chop up the veggies into mouth sized pieces. I used half the cucumber, half the onion, some of the cauliflower, all the kale, and all the carrot. It's not an exact measurement, you just want a good amount to toss into the salad. Barley in bowl, topped with the veggies and pumpkin seeds.... The pretty before the mix. You don't need to add it like this, I just did it cause it looks good. 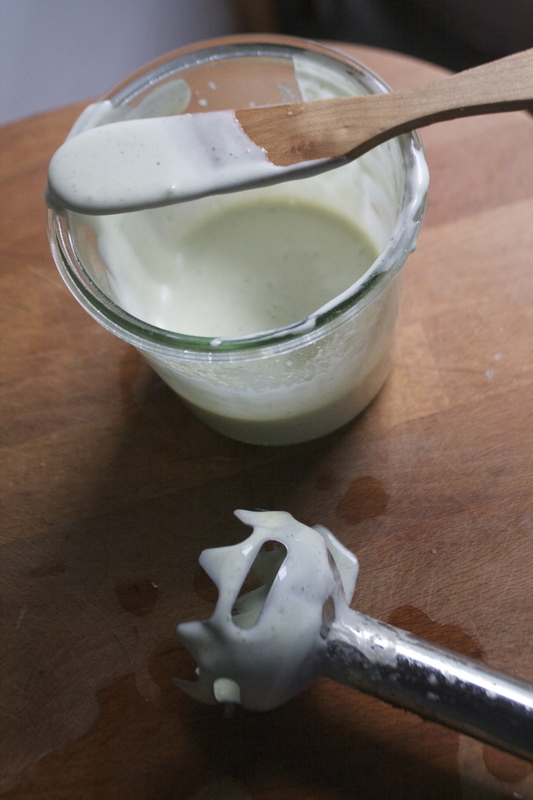 And the tahini sauce. Mince garlic and add to a jar or bowl with the juice of the lemon, vinegar, a pinch of salt and pepper and give it a really good mix. Creamy, zippy, oh so good. 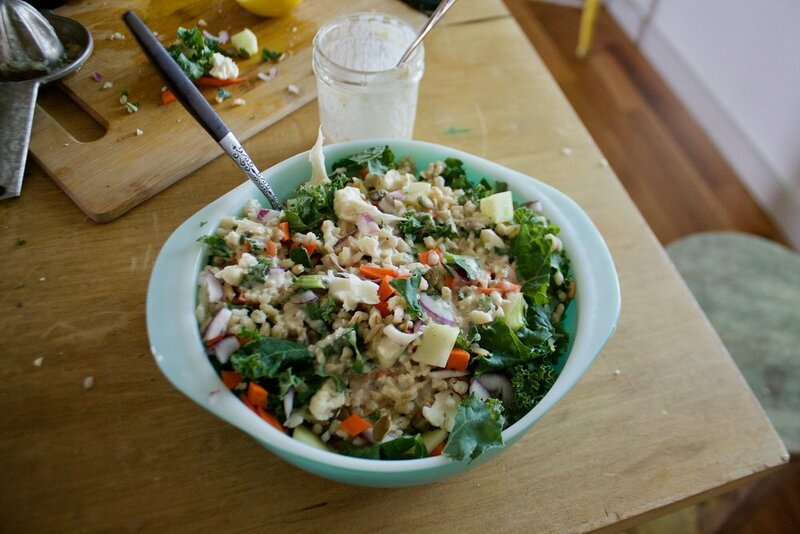 Drizzle and toss the dressing with the barley and veggies. And that's that. Now you are ready for eating. Enjoy wherever this salad takes you. Note. The vegetable amount and type is more of a preference. You could use all cucumber and onion or add broccoli and pepper, just make sure to have a least 3 good cups of some chopped up color. Place barley and water into a pot and bring to a boil. Turn heat down to low and continue to cook until barley is tender, but not mushy, which should take about 45 minutes. Once cooked, strain excess water. While the barley is cooking, chop all the veggies into small mouth sized pieces. And make the tahini sauce. Mince garlic and place in a bowl or jar. Add in tahini, the juice of the lemon, and the vinegar. Mix well until smooth then season with salt and pepper to taste. When barley is cooked and drained, let cool for a few minutes then place in a big bowl. Add in all the veggies and the toasted pumpkin seeds, then drizzle with the tahini sauce and toss all around. Season with salt and pepper to taste..
Now eat still warm, or later at room renature, or place in fridge for it to get cold. It can be a filling meal or a great side dish. It's good all ways, any way. Another note. This salad is great for parties and BBQ's and can be made a day or two ahead. If you do make ahead, hold off on mixing the pumpkin seeds and the tahini sauce with the rest of the salad until you are about to serve it. Pickles. And potato salad. It only made sense to make a pickled potato salad. So make it I did. And oh boy oh boy, there is nothing better then a rich and creamy salad consisting of potatoes other then a rich and creamy and pickle tart salad of potatoes. I hit the nail right on the head with this one. The mr and I ate the entire salad all to ourselves and way to fast. Now it is gone and I didn't get a chance to share with anyone. But it's ok, cause this is definitely going into the summertime potato salad rotation. And to all who may not be a pickle fan, or need to make 2 potato salads, (it is always good to have a variety of potato dishes at any BBQ ) try this guacamole potato salad, another favorite. The stuff. Potatoes of course and half a sweet onion, a cup or so of navy beans in the aquafaba ( bean water), left over pickle juice, fresh dill, dried dill, garlic, olive oil ,salt and a pepper. Yes there is a lemon pictured, but I was actually using that to squeeze into my water so yeah, not needed in the potato salad but you should grab a lemon and a big tall glass of water and drink it. Keep yourself hydrated. Get the potatoes going. 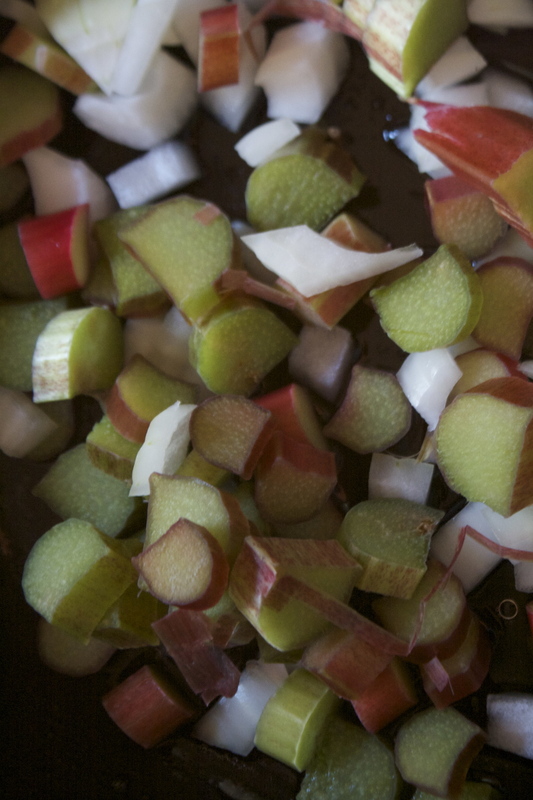 Chop them up into small piece and place into a big pot. Cover with cold water and add in a good bit of salt. Stick the pot on the stove and boil those taters. While potatoes are boiling, strain the aquafaba (bean water) from the beans. And chop the onion into little pieces and stick into a big bowl along with the strained (and now rinsed) beans. Pour in half the pickle juice and give it a good toss then set aside and let the pickle juice do it's thing. The potatoes are boiled until fork tender and drained..
Toss the strained potatoes back into the pot and add in the bean/ onion mix and the rest of the pickle juice. Give it all a good toss and stick the pot into the fridge for about an hour until the potatoes are cool. And a pickle. If you have one, I highly, HIGHLY, recommend chopping one up and adding it... I mean it is a pickled potato salad after all. So now you have a great, fantastic, knock your socks off, salad to make for any of your weekend BBQ needs. Now have a great, extra long weekend! Chop up the potatoes into mouth little chunks ans place into a pot . 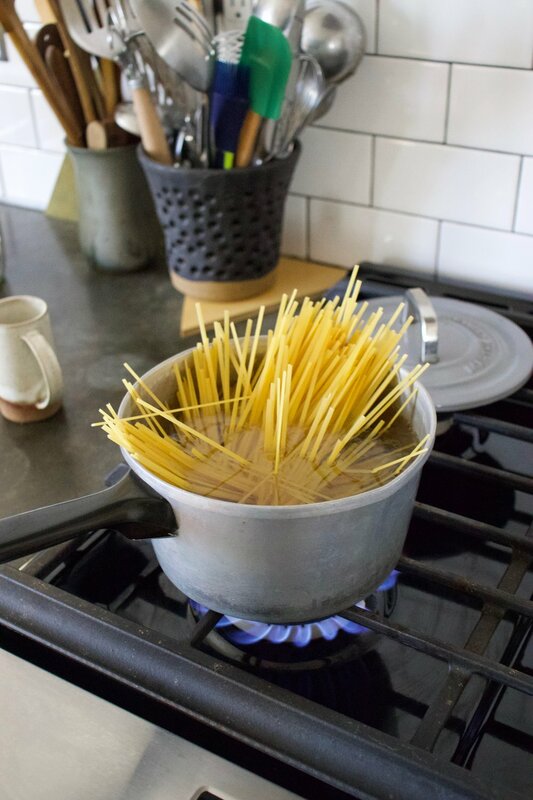 Rinse them and them cover about with about an extra inch of cold water, Ad d in a a good sprnkle of salt (like a tablespoon) and stick on the stove. Bring the pot to a rapid boil then turn heat down a bit to a low boil and cook until the potatoes are fork tender. Now grab the strained bean juice, about a tablespoon of pickle juice, the garlic, and the dried dill, Either with a hand blender or regular blender, start blending all that together while slowly pouring in olive oil (about 1/2 a cup ) until the sauce is thick and creamy. Season with salt and pepper to taste and place in fridge to hang until you need it. And once the potatoes are cooked, strain them then add them back to the pot along with the bean/onion mixture and the rest of the pickle juice. Toss around to coat evenly and place into the fridge to cool. After about a half hour its a good idea to give it a toss to make sure the juice is getting to all the potatoes. Like any potato salad, serve with your favorite foods and keep in the fridge when not being eaten.